The Siemens/Kelco contract was the longest and most recent contract which I have had the pleasure of being involved. I was allowed a very free reign when it came to designing solutions for the specific requirements of the site. These solutions were very well received and I was asked to present my software to staff from other Kelco sites around the world. The graphic below is the distillation column at the Knowsley site. This is turnkey, meaning that the operations personnel can just ask it to start and the software will ramp things and bring things on line in a pre-defined sequence. It will then regulate it's output according to the levels in the receiving tanks. It is cheaper to run the distillation column at a lower rate for longer than it is to run it at maximum and allow it to cool down when it is not required. This graphic is the top level graphic there are many faceplates attached to this graphic and a messaging window that pops up to tell you any alarms or provides you with startup, shutdown information. 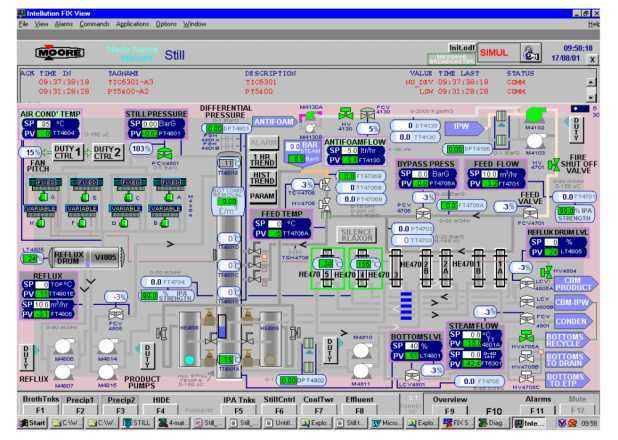 The Air fin condenser fans in the top left hand corner of the graphic above are controlled by a Duty / Standby block - Allowing the user to provide weightings to each of the fan / pump duties whilst allowing full automation of the Duty rotation. This has been explained in more detail in it's own dedicated section.